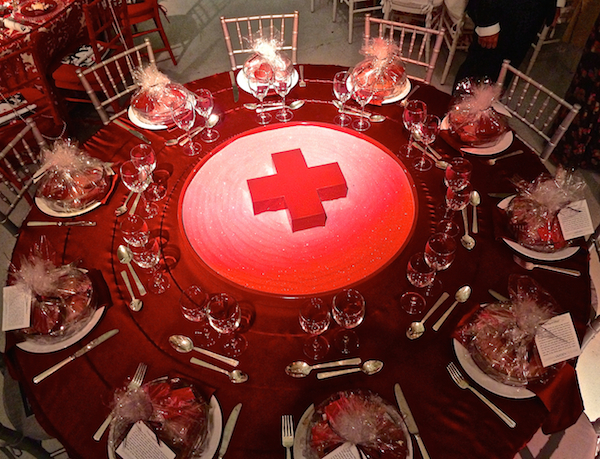 Saturday night the Metro New York North Red Cross held its annual Red & White Ball, one of the largest fund raising events in Greenwich, CT. With hundreds of glamorous guests, they raise much needed monies to provide immediate humanitarian aid to those affected by emergencies and disasters. 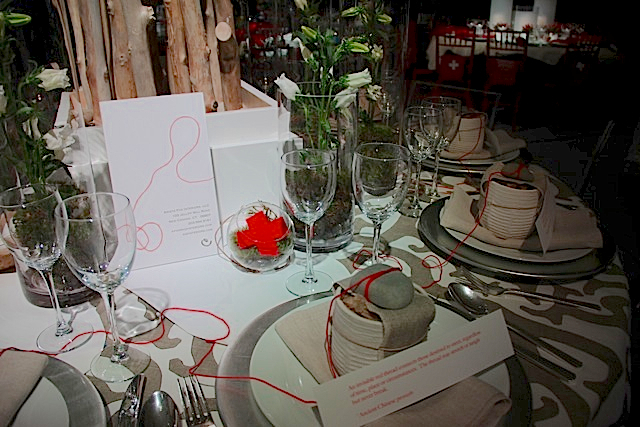 This year’s theme, Designs for Hope, brought out many top designers to contribute to the cause. and flowers from The Flower Bar. Peter Fasano created a whimsical table with Ondine Karady reminding us to connect with the child inside. 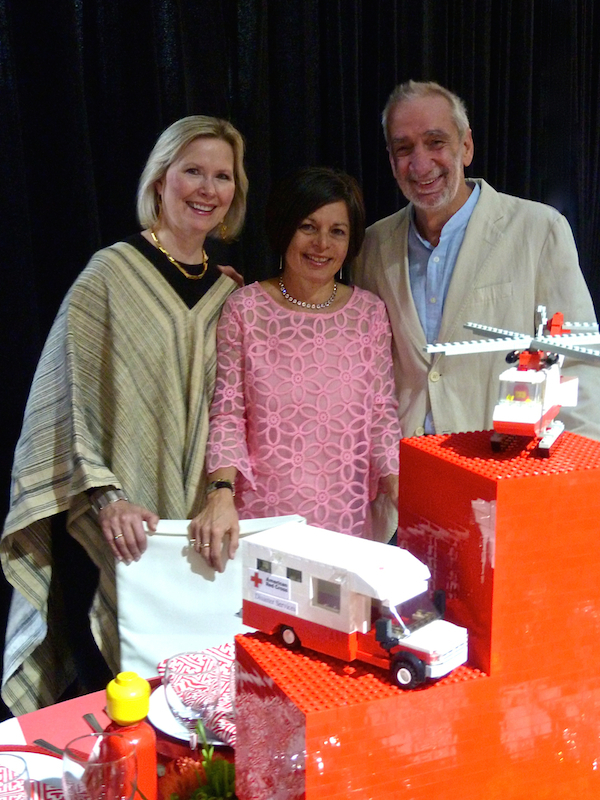 My love of Legos is well documented and I appreciated all the clever touches including the red cross centerpiece built by Bill Probert, local Lego maestro. 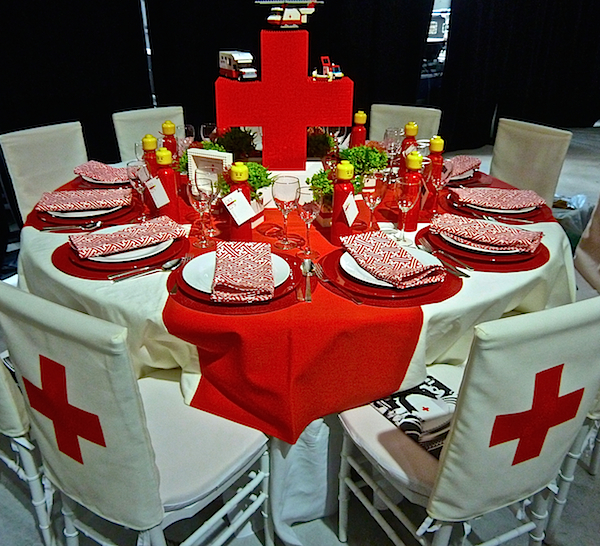 Peter designed and executed the tablecloth red cross, napkins were in wife Elizabeth Hamilton‘s Pambell with Lego water bottles offering a BIG thank you. Below, left to right, Elizabeth, Beth Dempsey of Images and Details, Design Coordinator for the event, and Peter. 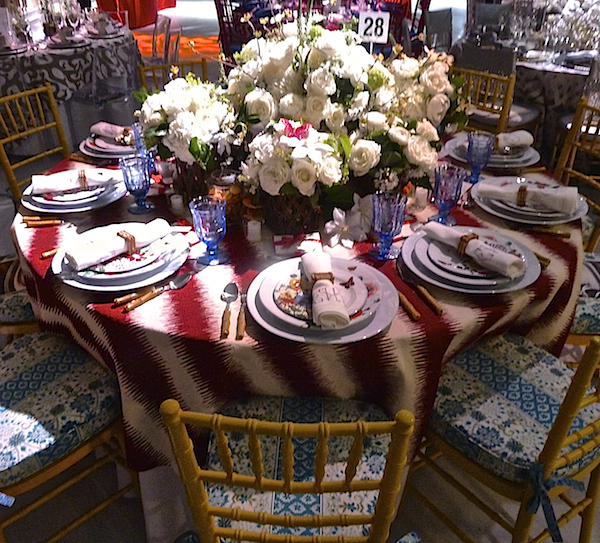 Matthew Patrick Smyth‘s exquisitely appointed table was an ebullient ode to Paris. 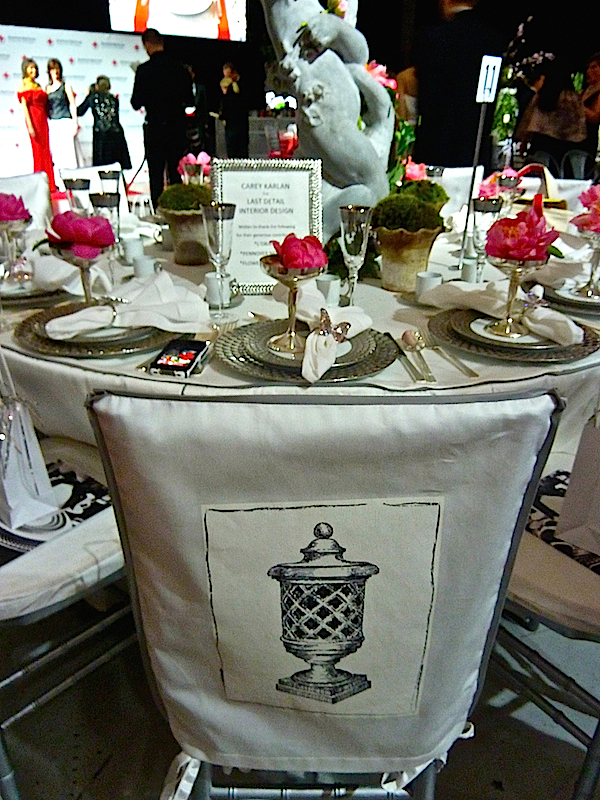 With a tablecloth printed with an 18th century map of Paris, elegant accoutrements were from Christofle. 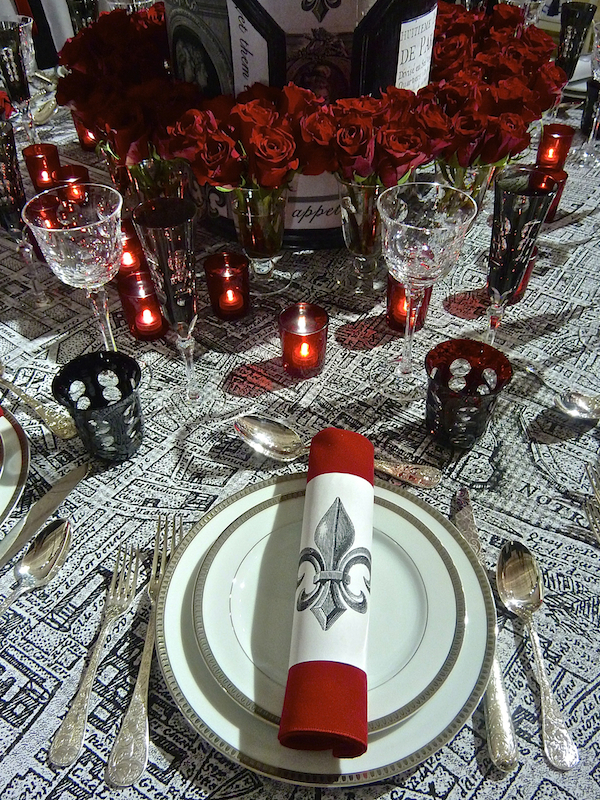 Carey Karlan‘s table also beckoned us from the city of lights, with a fresh evocation of a Parisian park. 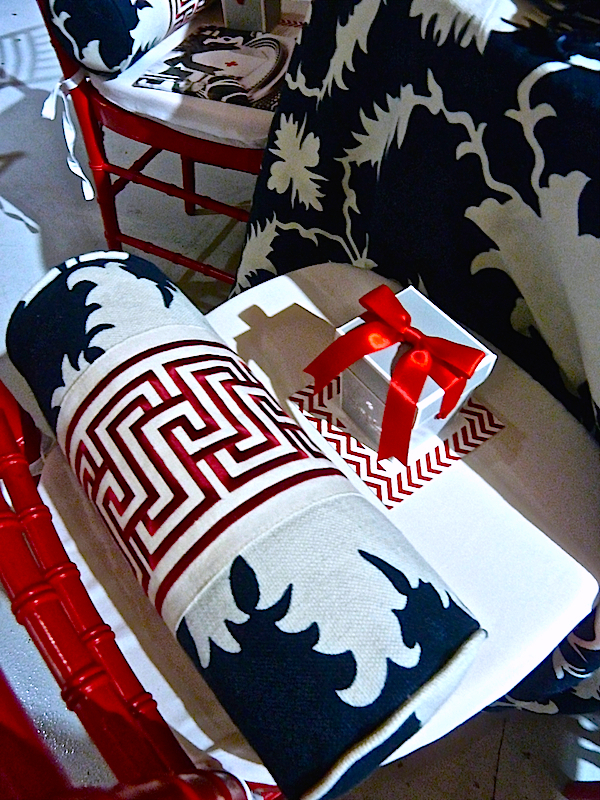 Charming illustrations by B. Russell Melzer graced the chair’s slipcovers. 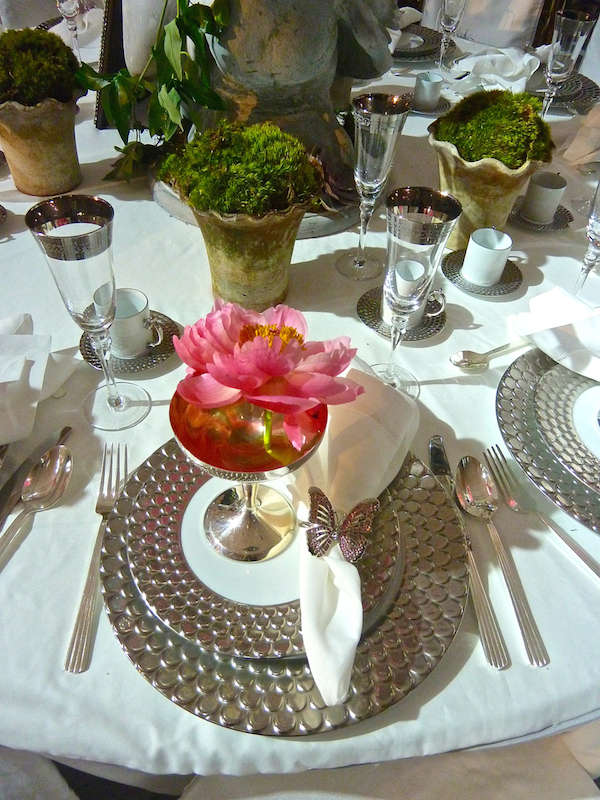 It felt like springtime in Paris with tabletop dinnerware from l’Objet, charming pots from Pennoyer Newman and blooms from Flowers & Flowers. 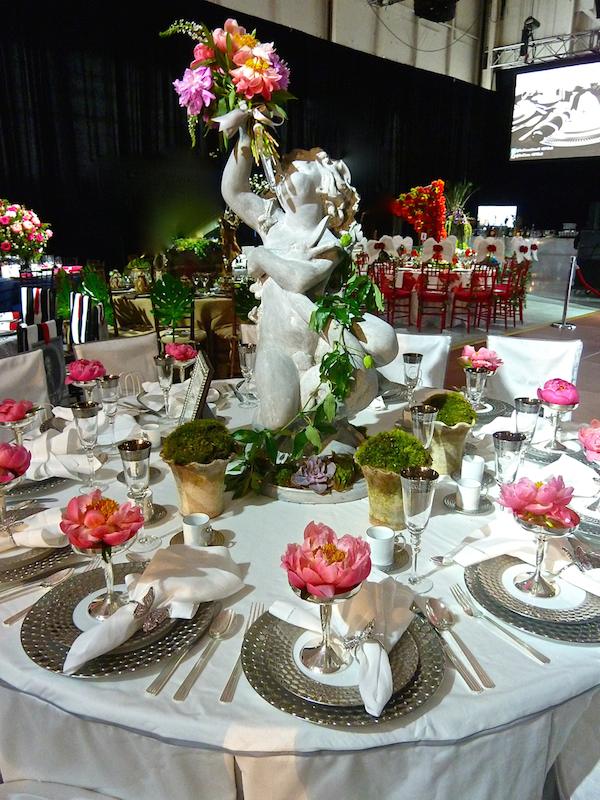 Silvina Leone’s amazing table was an extravagant homage to the 17th century. “My tabletop designs are always inspired by old master paintings and, in this opportunity, I focused my research on French and Dutch seventeenth century art and those enthralling tabletops proudly parading beautifully crafted items and encrypted with coded meaning.” Using Alessandra Branca’s Melogano linen damask for Schumacher, based on an Italian textile of the same era, she amassed a tabletop collection expressing a palatial ode to nature. 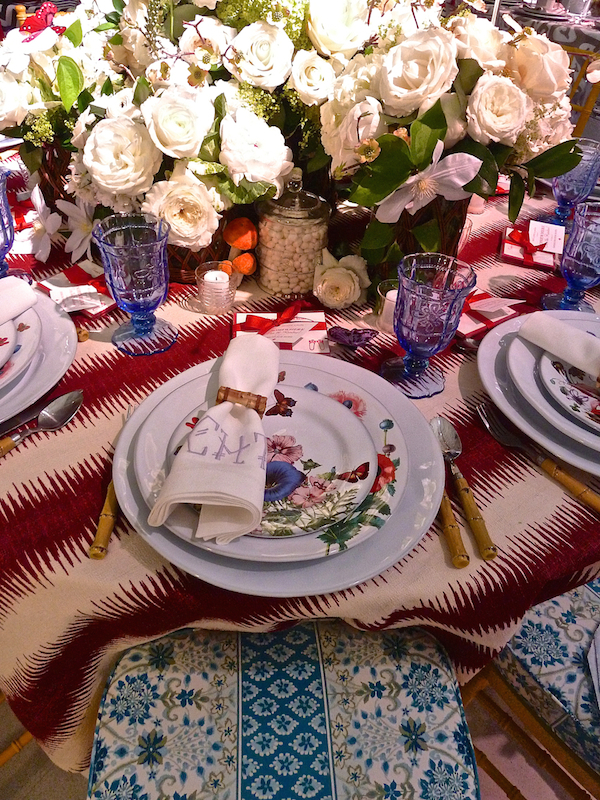 In chatting, I discovered that she sourced the glasses at the Dior Home store after reading my piece on the fabulous shop and actually commissioned the charming ceramic scallions at each place setting. 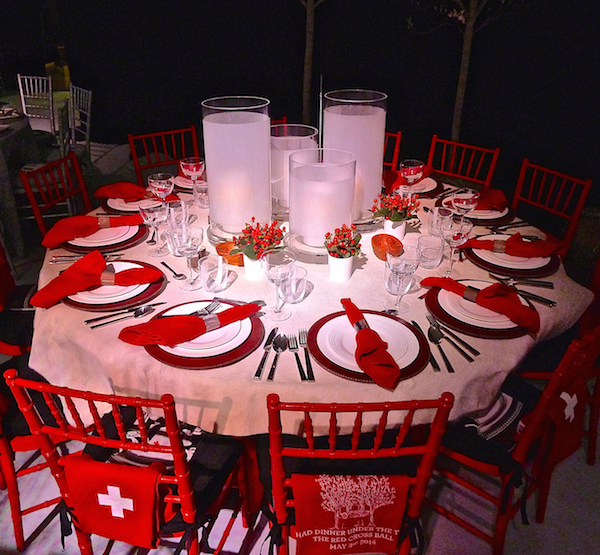 “Superb craftsmanship as well as an appropriate color and material combination for this event (i.e. 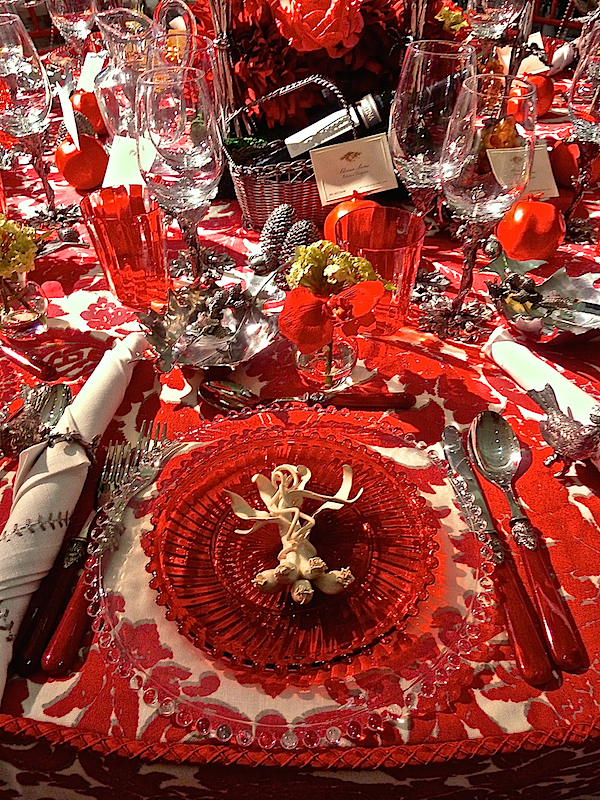 red-white-pewter-translucent and colored glass) controlled the selection of fabric, glassware, flatware, plate and décor arrangement.” The chic designer and I share a love of fine workmanship, travel, jewelry (her necklace was divine) and more. I’m sure we’ll be visiting with Silvina again sometime soon. 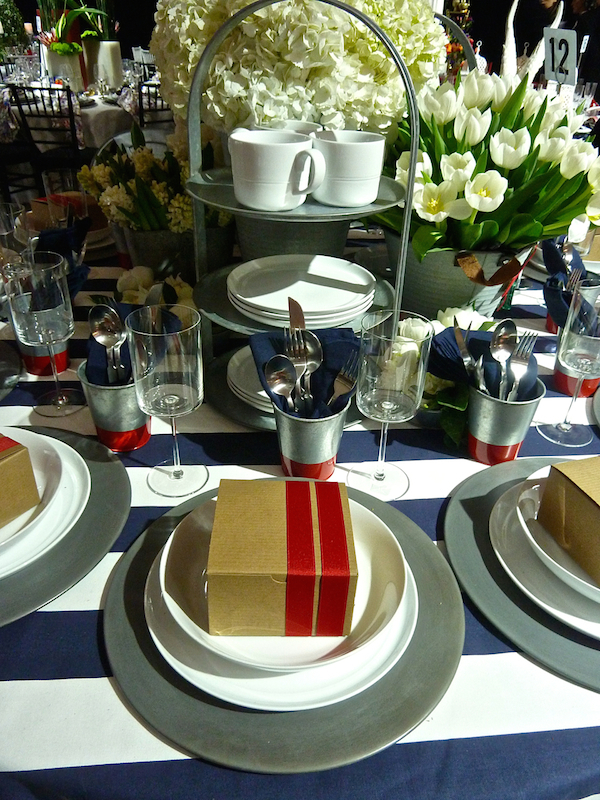 I loved Suzanne Eason‘s chic take on red, white and blue. 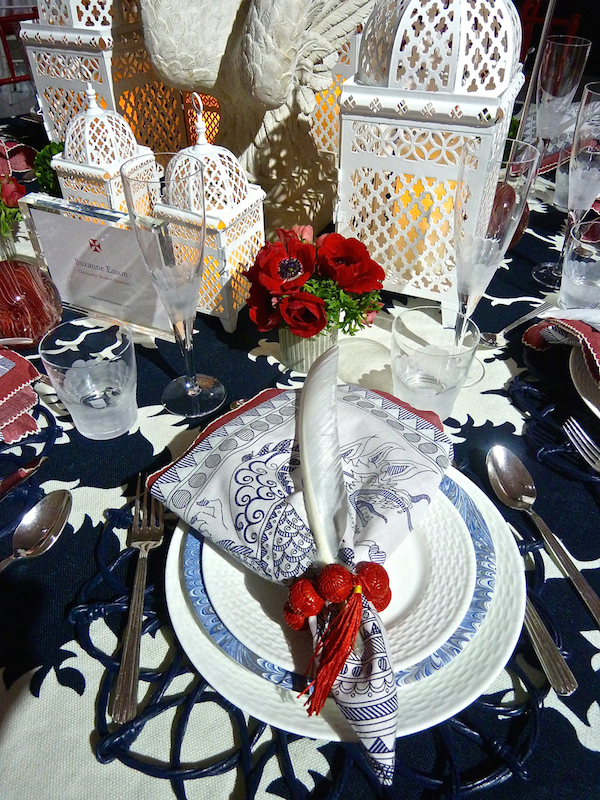 Her table featured such beautiful layering and so many wonderful details. I only wish I had had a chance to write her to include all the sources for you readers looking to enhance your tabletop collections. 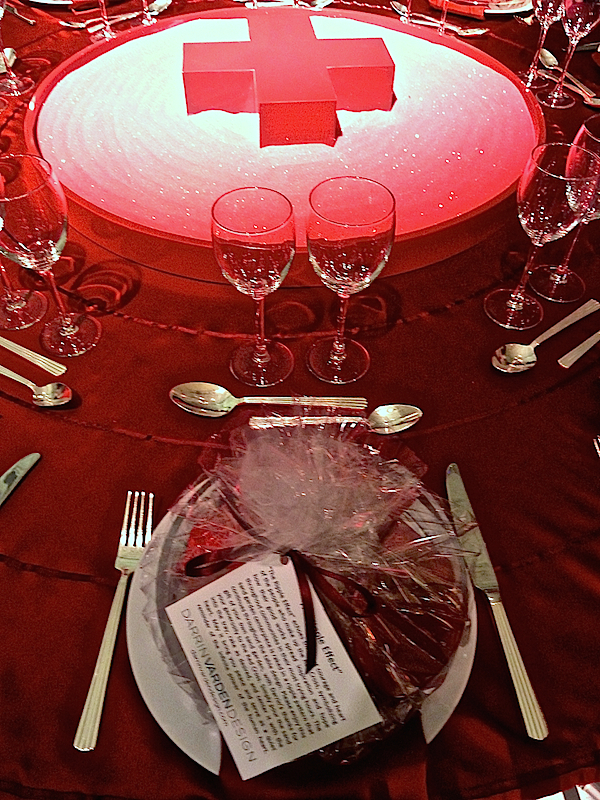 And I’m wondering if the lucky table guests got to go home with these stylish custom bolsters. The Nanz table, designed by Alisberg Parker Architects was of tonal elegance in gray and purple. 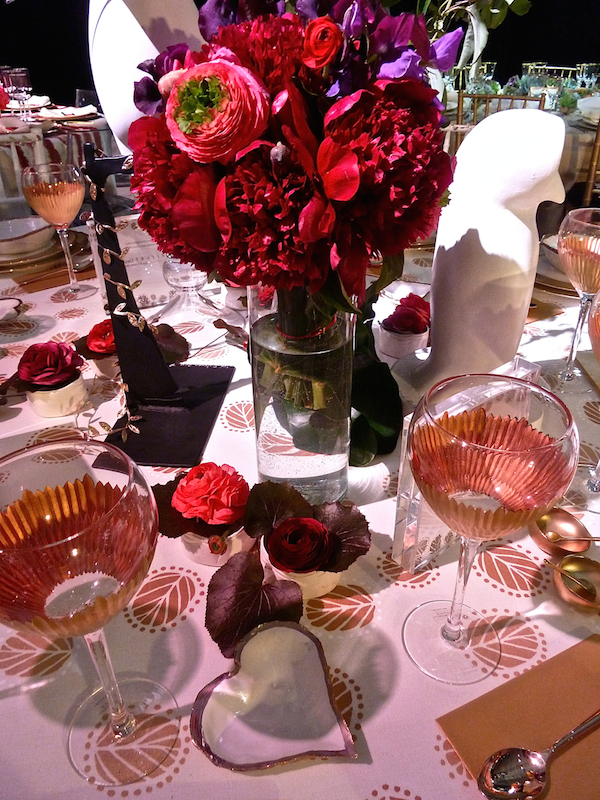 Juliska plates and Baccarat stemware were a lovely counterpoint to the lush modern centerpiece adding the warm accent of copper. 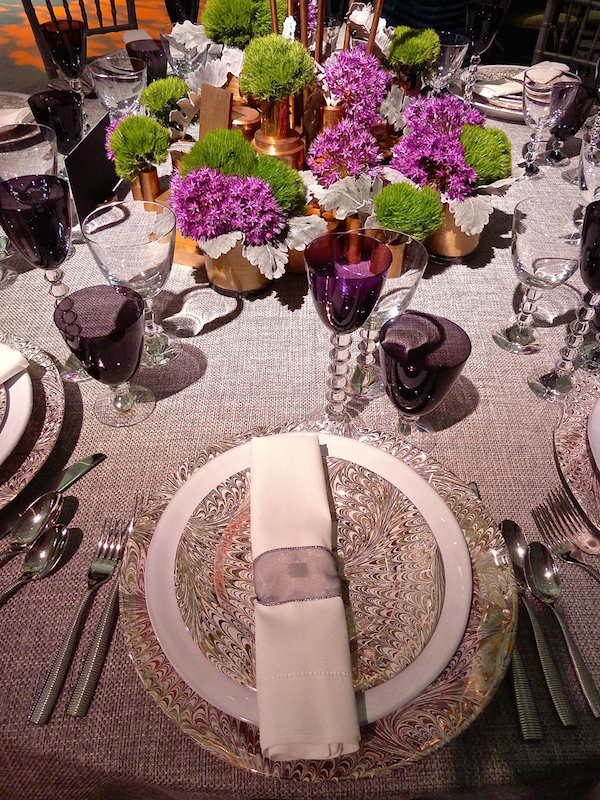 Francine Gardner of Interieurs presented a fresh take on the metallic shade du jour. 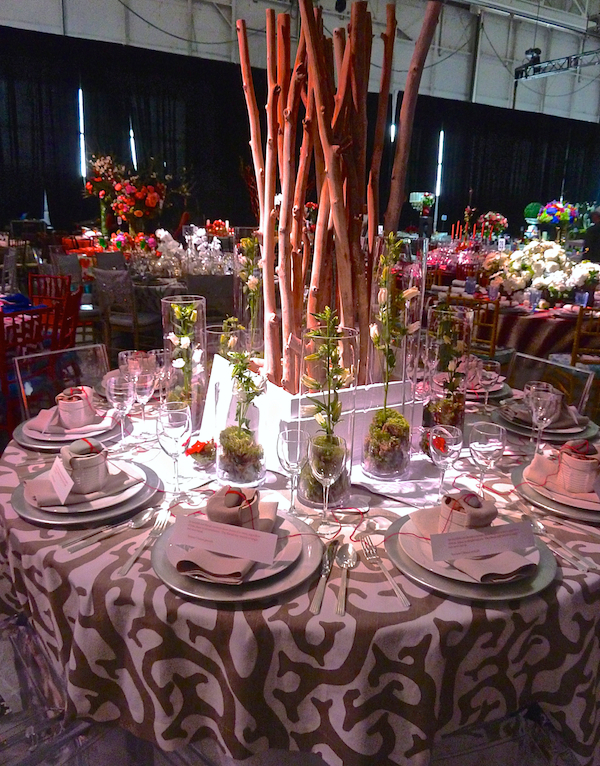 Her tablecloth design, custom printed by Peter Fasano, was a modern take on a natural theme. 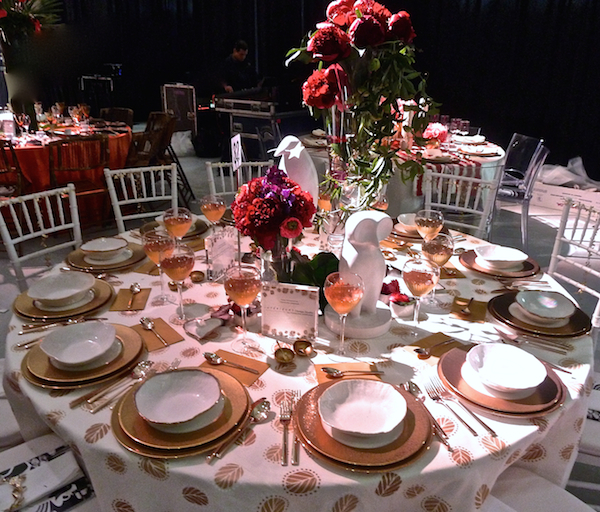 Hand crafted accoutrements within the gold palette added a glowing warmth against the lovely floral centerpiece. 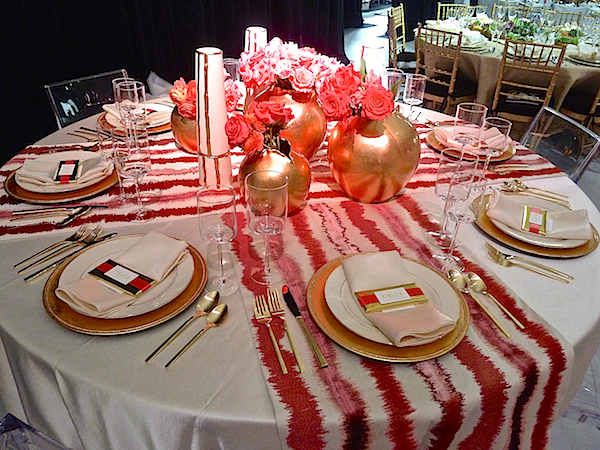 Gold was also the theme at the table by Pimlico, where pink and red accents added a fresh femininity. Simon Teakle, owner of the eponymous Greenwich shop of exquisite fine jewelry and unusual objets d’art, created a clever table highlighting one of his unusual finds – a silver model of a R.A.F. F.E.2B plane. Hallmarked in London in 1917-18 by Edward Dime, it hung as the featured element within the statuesque centerpiece. 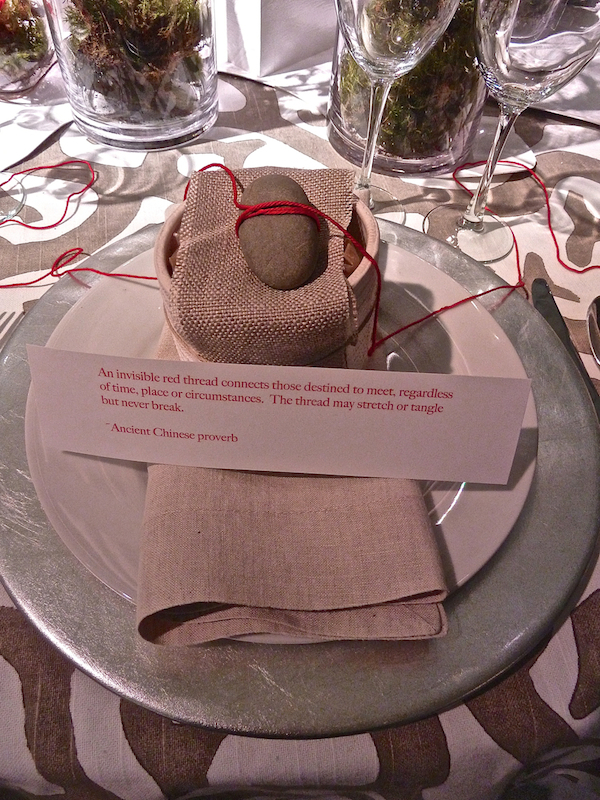 And I loved how he cleverly folded the napkin to resemble a nurse’s hat – so charming. 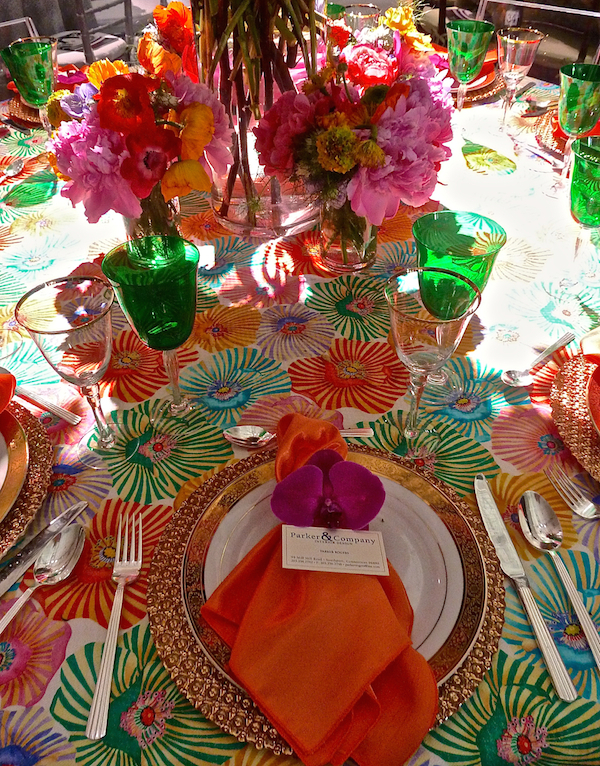 It’s clear Parker Rogers loves color and his table was a cheerful explosion of floral brights. It would have been impossible not to be in a good mood among the kaleidoscope of spring bounty. 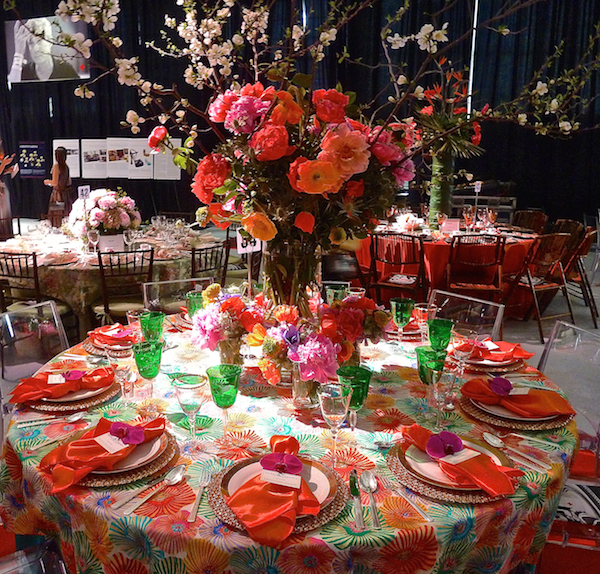 Event newcomer Catherine Tompkins of My Life in Parties made a terrific first impression with her “Over the Rainbow” table design. 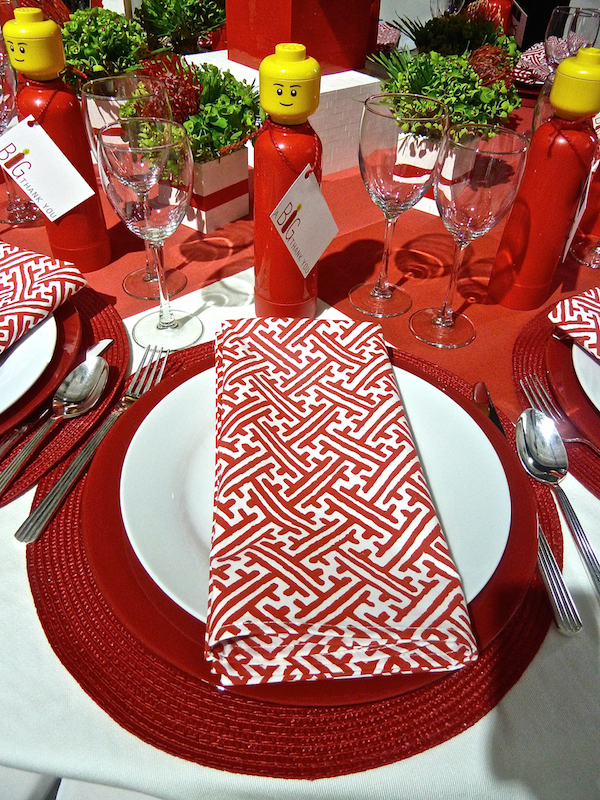 I immediately recognized the Tilton Fenwick for Duralee Rocat on the chair cushions, which coordinated wonderfully with the Juliska dinnerware, glasses and flatware. 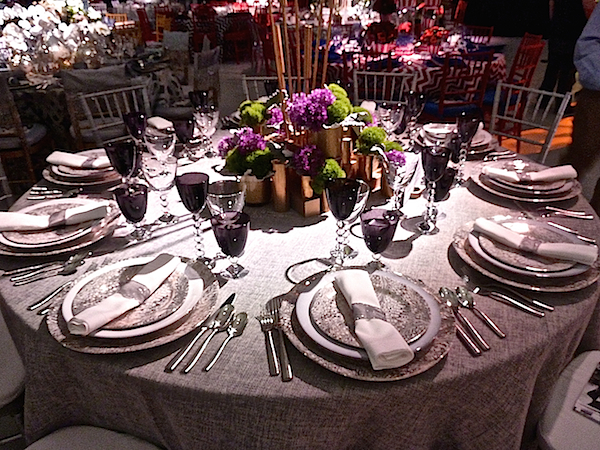 Beautiful Leontine Linens napkins and a spectacular all white centerpiece from Greenwich Orchids completed the fearless combination of color and pattern. 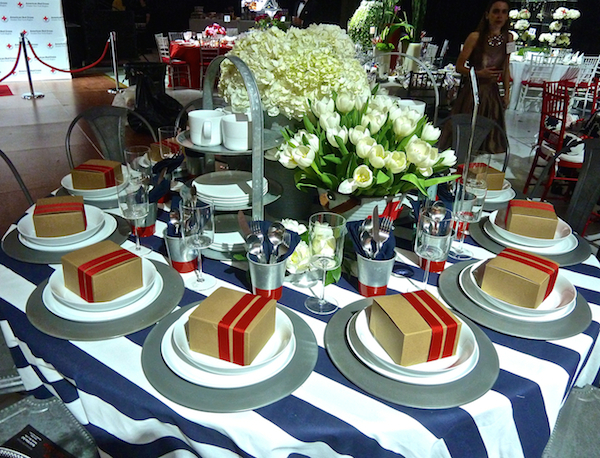 Kudos to all the designers for their beautiful contributions to the Red Cross Red & White Ball this year. This entry posted in interior design. 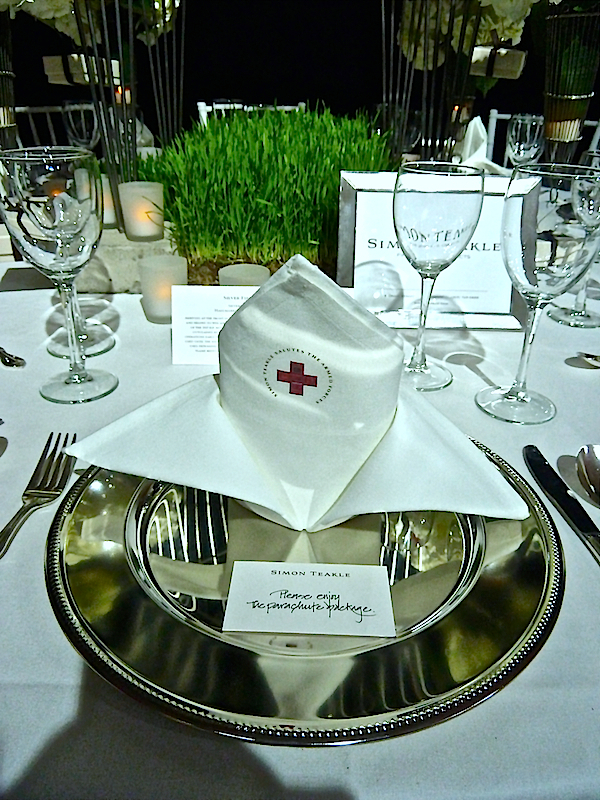 Entry Tags: Greenwich Red Cross Red & White Ball, interior design, Tabletop Bookmark the permalink. Fantastic coverage of a terrific event! 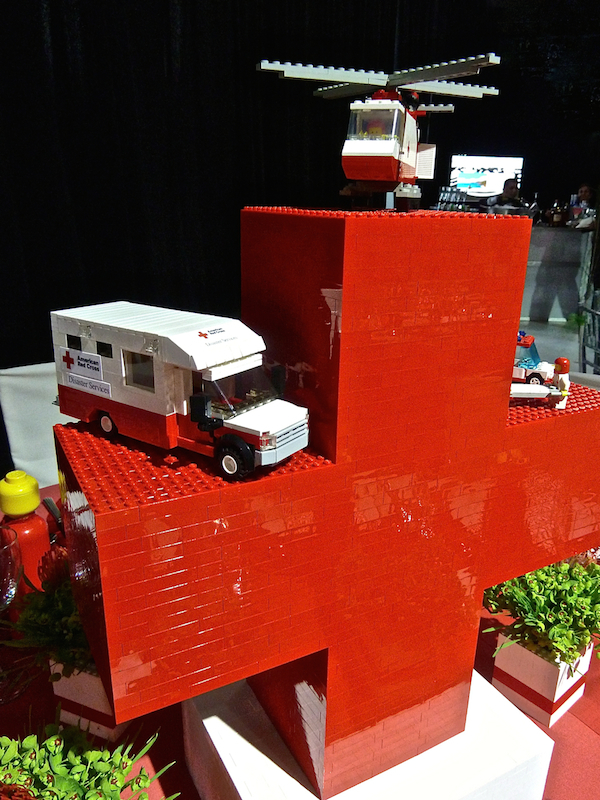 The nurses caps, the plane, the Lego cross, really creative designs by all. What I wonder if how do these designers find the time to keep their projects going, volunteer for these events and look fabulous too? You can tell that everyone really enjoyed the party. 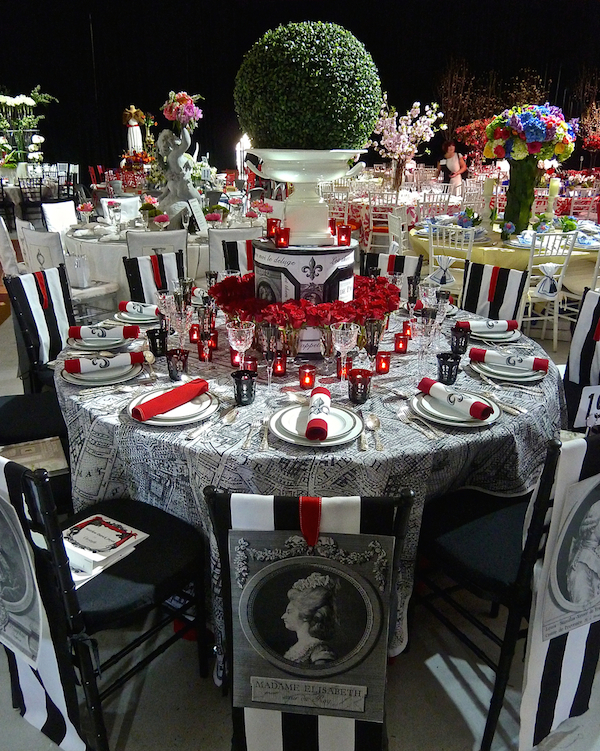 Thank you Stacey for including my table! It was great to participate in such a worthy cause. Beauty, design and great style combine to contribute to the well being of us all! 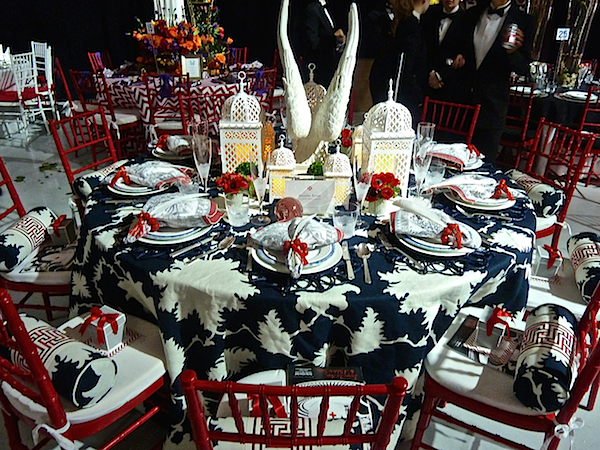 Love the style and creativity of the tables and for such a great cause. 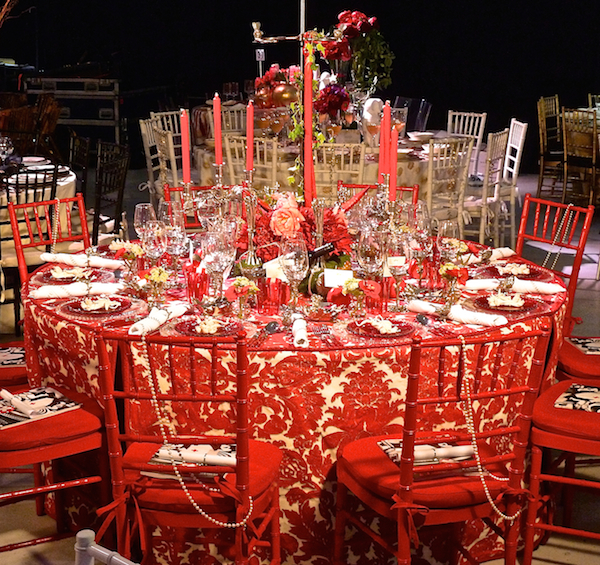 Stacey, I am constantly astounded by the artistic creativity shown at these important events! 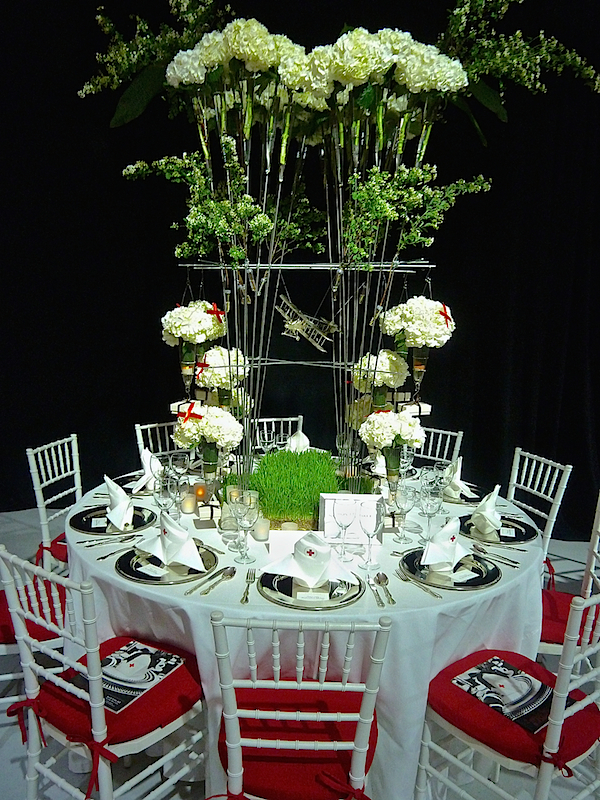 I could not even begin to choose …though Francine’s and Patrick’s really spoke to me…all are luxuriously done ! Stacey – So happy we were all there together and thanks so much for including us. Twas quite the event and we were so happy to be included. See you in LA! Thank you SO much for your kind words and support Stacey! It was such an incredible event from beginning to end. We were absolutely thrilled to be a part of it! 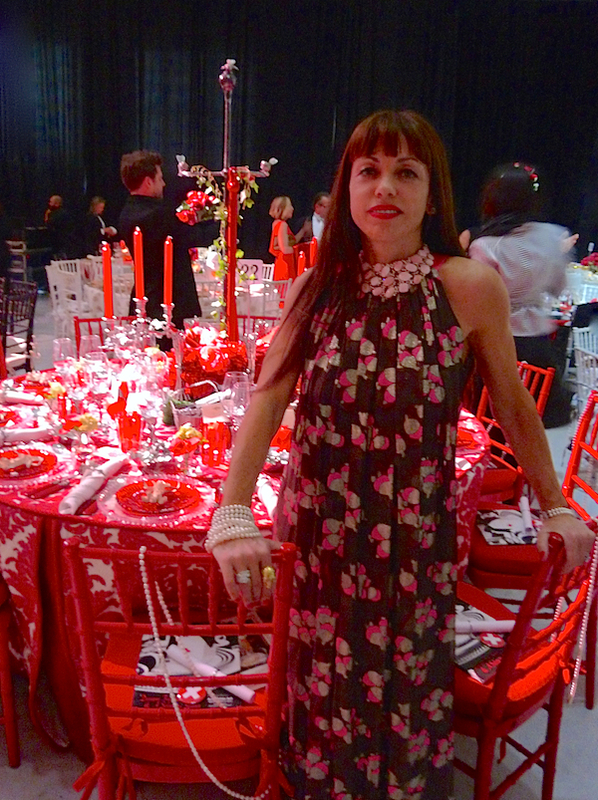 Stacey, your coverage of the Red & White Ball’s tables is tremendous. Your photography and eloquent words capture the essence of everyone’s creativity so well. Thank you! Stace…you know Francine is a member of our By Invitation Only group, she’s so very talented.